1. Match your scarf with your outfit, but do not match it too much. Try to match it up with your footwear or handbag. 2. Try to mix patters with solid, like if you are wearing solid colored shirt then wear a patterned scarf and vice versa. 3. Drape your scarf over your head and style it even more with bold sunglasses. 4. Team your scarf with a belt, let the two ends fall down over your chest and secure them with a thin belt. This will give you very neat and tidy look and will keep the scarf in place during windy weather. 5. Need a walk at the pool side or at the beach, then wear your scarf as a Sarong (wrap it around your waist and tuck it). 6. Instead of headband wrap a scarf around your head, this will keep your hair away from your face and make you look stylish. 7. Pair your scarf with your sandals, just tie them around you ankle. This look super chick! 8. 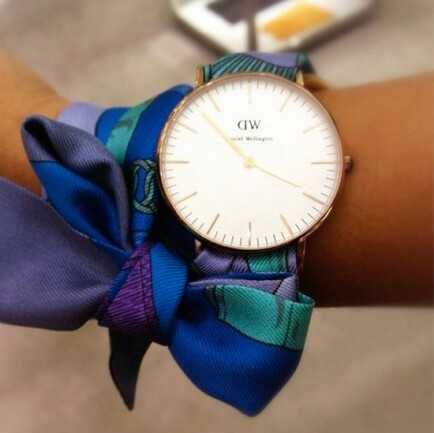 Tie your scarf around your wrist and style them with your bracelet and watch. You can even replace the strap of you watch with a scarf. The idea is super cool! 9. Use scarf as a belt, just tie it around your waist. Let the ends hang loosely or you can also tuck them up. Totally your choice :). 10. Pair scarf with a shirt by putting it under collar of your shirt. So which one is your favorite way to style a scarf?